Signed & Numbered Limited Edition 3D Artwork by. Image Size : 4 1/2" x 4 1/2" or 11.43cm x 11.43cm. 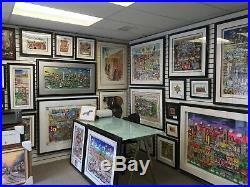 Approximate Frame Size : 12 1/2 " x 12 1/2 " or 31.75cm x 31.75cm. Published : 2001- Edition # 195/200. A Certificate of Authenticity (COA) from Charles Fazzino included. Framed in a 1 inch Matte Black Wood Frame. 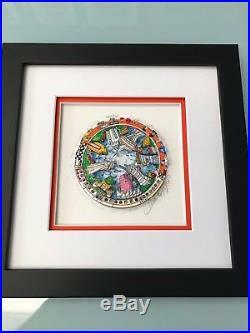 Matted in a 2 inch White Acid Free Mat with a 1/4 inch Inner Orange Color Acid Free Museum Mat. 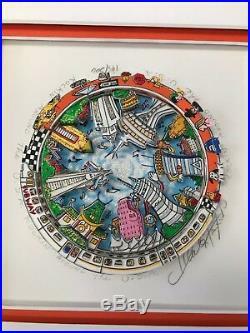 The item "Charles Fazzino Rockin Around The USA 3-D Art Signed & Number Framed" is in sale since Tuesday, February 19, 2019.